Cleaning out and rearranging the kitchen cupboards, I realize how much “stuff” I have and how much of that stuff is favorite cooking utensils. Just about every cook I know has a special affection for his or her knives, which are the most essential part of any kitchen toolkit. There are so few recipes that don’t require cutting, chopping, or slicing something. I have a bit of a knife fetish myself. I have a ten-inch Wüsthof chef’s knife, a ten-inch Henckels chef’s knife, and an eight-inch carbon steel Sabatier chef’s knife that I went through culinary school with. Yes, the Sabatier does rust and requires a little more care, but it also sharpens easily, which was important in school. I also have two exquisite handmade Misono knives, eight-inches and a six-inches, that my husband brought back from a business trip to Japan. 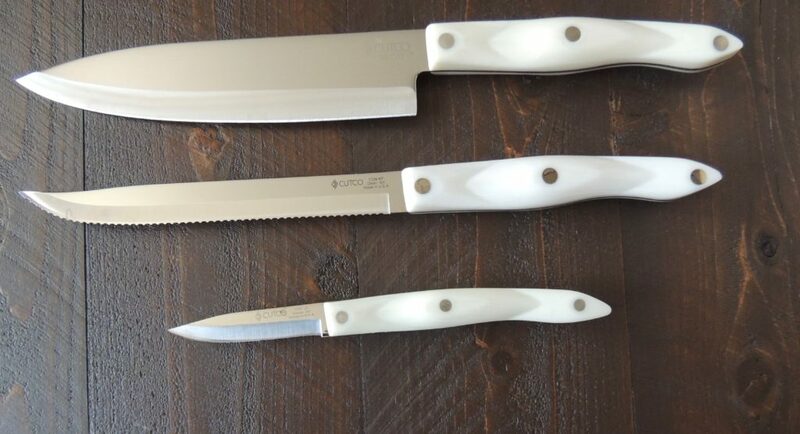 I purchased a set of Cutco knives in the 90s and then another set when I started teaching at NYU’s Department of Nutrition, Food Studies and Public Health – my work knives. 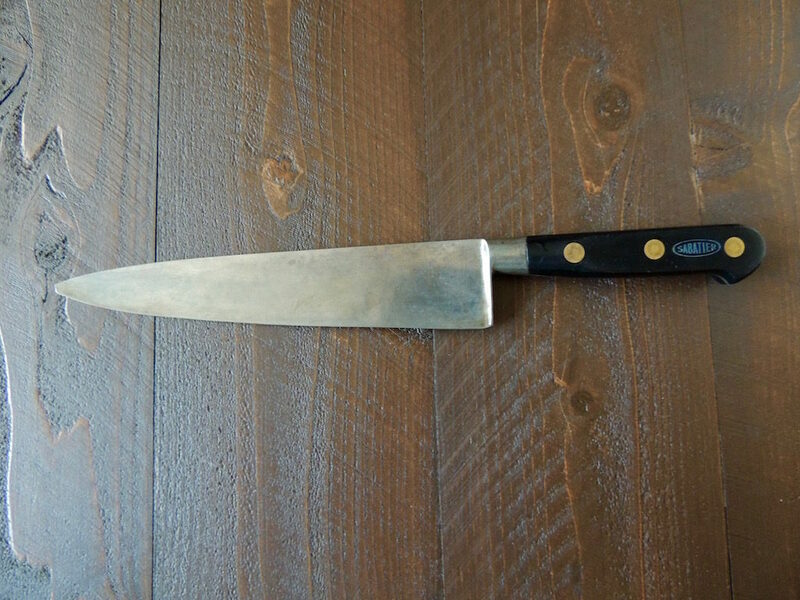 I also have my father’s carbon steel butcher knife from when he briefly apprenticed to become a butcher. Starting with a great set of knives is crucial, but care is just as important. Cutting with a dull knife is dangerous because you apply more pressure which increases the chance you’ll slip and cut yourself. I use the Cutco knife sharpener regularly and finish with a few swipes on a knife sharpener steel to smooth the edge. All you really need to own to achieve most cutting chores are a good chef’s knife, a serrated edged knife, good for slicing crusty breads, biscotti and thin tomato slices, and a 3- or 4-inch paring knife for small jobs like deveining shrimp or removing strawberry hulls. Every year I have them professionally sharpened. 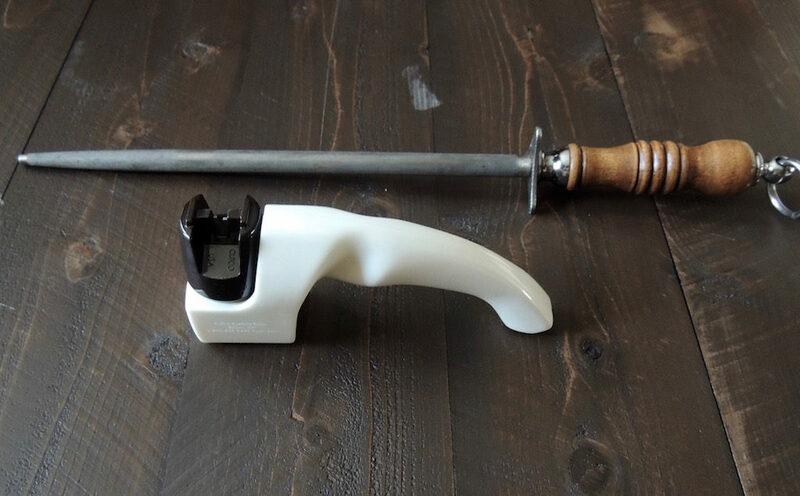 Cutco sharpens their knives free of charge—you just pay shipping. The non-Cutco knives, I send to a local knife sharpener with excellent turn-around service. Good measuring devices are also a big must-have, especially for those of us who spend a lot of time recipe testing and baking. I used to work with glass Pyrex tools for liquid measurement, but after a friend of mine found a glass shard in her cake, it inspired me to switch to plastic. I use a measuring cup with slanted sides so I don’t have to crouch down to make sure I’m getting an accurate measurement. For dry measurements, I have innumerable beautiful metal cups in any measurement you can imagine, including 2/3 cup and 1/8 cup. 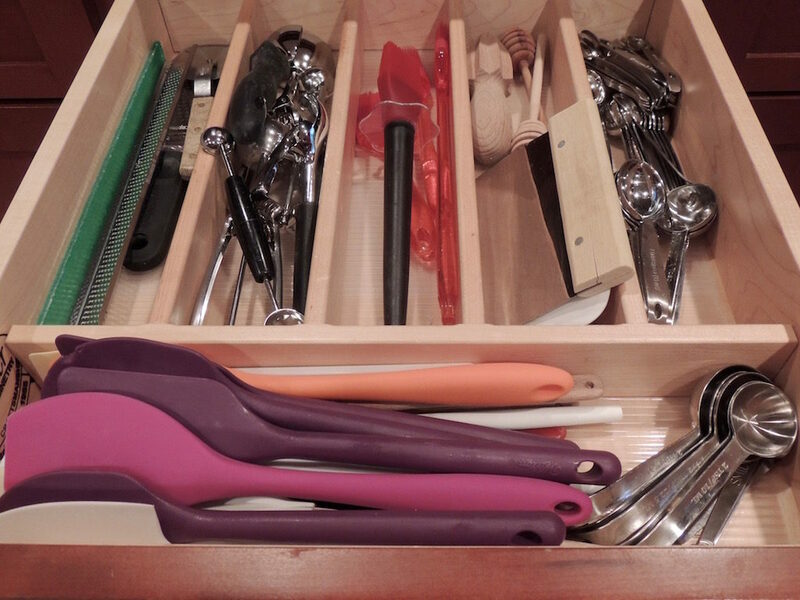 And don’t even get me started on measuring spoons—I have an entire drawer slot full of them! My small tools drawer – and yes, I have many occasions to use multiples! Beyond the basics, I have a digital scale that I love for making meatballs and dinner rolls (it might sound particular, but I want them to cook evenly). And I love my meat pounder for chicken (I pound it out to avoid dry, overcooked ends) and for pork tenderloin, which I occasionally slice up and pound into cutlets. And I don’t know what I’d do without my All-Clad stainless steel cookware, which heats evenly and cleans up beautifully. I’ve received some curious implements over the years as gifts: a pineapple peeler, an egg separator (which always seemed more complicated to use than the old-fashioned method – my hands or the egg shells), and a sprayer you can insert into citrus. I confess, I’ve never found myself needing a “spritz” of lemon or orange juice for a recipe! Then there are those quirky implements that have had strange staying power. Back when I was a teenager, Tupperware parties were huge. I once received a freebie Tupperware orange peeler, which scores the orange with one end and slips under the peel and removes it in one clean section with the other. A very useful tool. And I know you can’t find a Tupperware celery keeper like the one I have; they don’t make it anymore, unfortunately. 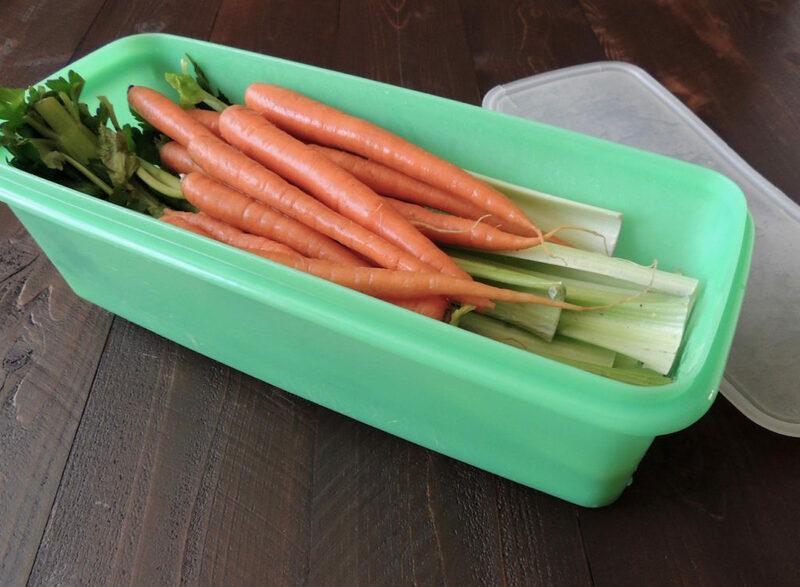 It holds celery (and carrots) above the water, keeping it fresh and making it easier to store. I’ve had both of these pieces for at least forty years, and as long as they last, they’ll get a place in my kitchen. What are some of your prized kitchen tools? There are as many answers to that question as there are cooks, but a few basic items will easily get you through the vast majority of Indian recipes.